I finally got up to Alta to skin for some turns. Ben Geiger, Zach Houston, Jon Gurry, Paul Story, Dave Stratton, and myself met up early Sunday morning in Little Cottonwood to do some skin time. We hit up East Greely bowl at Alta in some early season sugar. 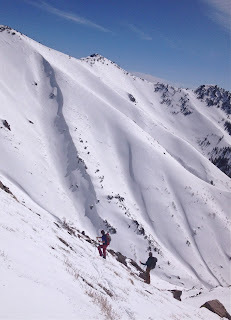 The day was bright and sunny and we had us a great day of skinning, talking smack, and some good turns too. It was a good chance to knock the rust off and make some early season tele rolls. I was feeling pretty rusty for sure, but I was flowing better by the end of the day. Good to get out, and I am glad to have my first turns under my belt. Looking forward to a stellar season, and here's to it.